We offer exclusive tours customized for you and your group. Pick-up and drop-off times are designed to fit your preferences and we can modify where we go to maximize your enjoyment if weather poses special challenges. Below are suggestions of some of the options we can design for you. Half-day tours also available. Perfect for photography enthusiasts and/or folks with limited mobility. Experience Arches National Park as few others do, exploring more remote areas and seeing fewer people. Learn how salt has given the Moab area such uniquely different features from the Grand Canyon, poster child of the Colorado Plateau. Explore fins, arches and colorful rocks of the park by vehicle and foot. Price: $250 per person (2-person minimum). Full-day exclusive tour includes hearty and healthy lunch, transportation and park fees. Inquire about group or family rates. RECOMMENDED FOR HOT SUMMER MONTHS. Explore the geology and natural history of the Moab area via the Colorado River corridor and the La Sal Mountains. Experience a variety of rocks types and formations up close, including dinosaur tracks, while interpreting magnificent views along the way. Price: $250 per person (2-person minimum). Full-day exclusive tour includes a hearty, healthy lunch and all transportation. Inquire about group or family rates. 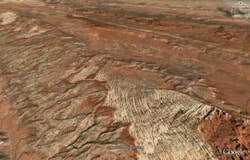 Igneous intrusions of the La Sal Mountains with mesas and fins of Jurassic-age sandstone. 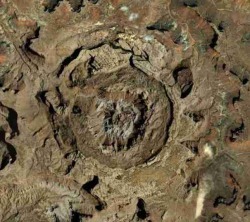 Explore the especially unique features of the Moab area in this tour to Canyonlands National Park from Moab. Examine new discoveries relating to Jurassic-era life and climate in the desert dunes of the Navajo sandstone; ponder the magnificent Upheaval Dome that draws hundreds of scientists a year, experience vast vistas that tell the story of the Colorado Plateau and discuss the interaction of geology and man through the millenia, including new oil and uranium exploration. Price: $250 per person (2-person minimum). Full-day exclusive tour includes a hearty, healthy lunch, transportation and park fees. Inquire about group or family rates. Rafts and inflatable kayaks are part of our floating classrooms. You have a chance to sit back and enjoy the scenery, taking photos, while we share our knowledge of the landscape with you. Oar-raft is typical, with paddle option available. Or, enjoy the extra freedom of guiding your own kayak (no experience required). Hiking and free quiet time are offered on all river journeys. Features: mining and other human history of the river corridor, river geomorphology including science behind recent changes and stories told by the canyon walls. Price: $175 per person, based on 4-person minimum. All full day exclusive journeys include a healthy, hearty lunch and transportation. Inquire about group rates. 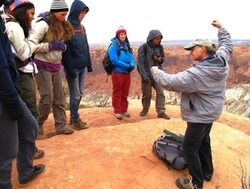 Spend all or part of a day with PhD geologist Tamsin McCormick in Arches and/or Canyonlands National Parks and beyond, in a hand-crafted presentation or tour from elementary to professional level, using your transportation. Ideal for individuals with specific interests or for groups seeking a higher level of understanding of the geology and natural resources of the Colorado Plateau and Moab area. Dr McCormick explaining Upheaval Dome to a school group. Kayaking is a great opportunity to really learn about the river. In a small watercraft you can feel the currents, eddy lines and waves. To become a complete boater these will be essential skills. Our guide/instructors can take you through the process, one step at a time. We offer full day and multi-day kayak journeys. The river corridor offers the best wildlife viewing and biodiversity on the Colorado Plateau. Experience the freedom of the Colorado River by paddling your own inflatable kayak, or relax on a raft on a one-day or multi-day trip. Our river trips feature small groups, and alternative locations and travel times to avoid the crowds and to maximize wildlife and bird watching opportunities. The trip features scenic side hikes and stops along the way to explore the natural and cultural history of the river corridor. Options include only calm water (for photo enthusiasts or those who don't want to get wet) or include Class I and II rapids. 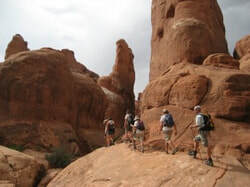 Our hiking tours encompass all the great elements of Moab. We enjoy outstanding scenery, visit rock art sites, learn about native plants, wildlife and area history while walking some of the coolest locations on the Colorado Plateau. If your goal is to truly know the landscape, you must walk through it and learn as you go. We feature guided hikes and van tours focusing on natural and cultural history in and around Arches and Canyonlands National Parks, including the La Sal and Abajo Mountains. Escape from the crowds and experience the solitude of the desert or alpine meadows. Wonder at the ancient rock art sites and contemplate recently discovered traces of Jurassic lifeforms. Our combination journeys are the best way experience the Canyon Country landscape. 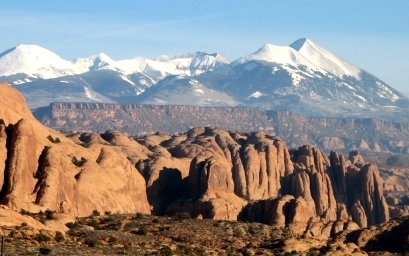 GeoTours offers 2 and 3 day journeys in the Moab area and longer multi-day private custom tours to areas beyond. Enjoy mountains, desert and river adventures by van, foot, kayak and/or raft. We can design your private journey for you! Call us now!. These programs help to support our service learning and conservation programs for students and adults in the Moab and Grand Canyon areas. We have generated over 50,000 volunteer hours for conservation and wildlife projects over the past 22 years through our parent non-profit organization, Plateau Restoration. Programs also support our mission to protect native habitats of the Colorado Plateau by ensuring an informed public.